We are Paul & Dean. As full time Palm Springs residents, we're just around the corner. We also have the home next door, VRBO listing #492065. If you like post-modern style, you'll love the house. We really tried to preserve the architectural integrity of the home, while making it comfortable, stylish and most of all fun. We like our guests to feel like they're getting away from it all, Palm Springs style! The Racquet Club Road Estates was built by the Alexander Construction Company between 1959 and 1962, and designed by William Krisel of Palmer and Krisel Architects. 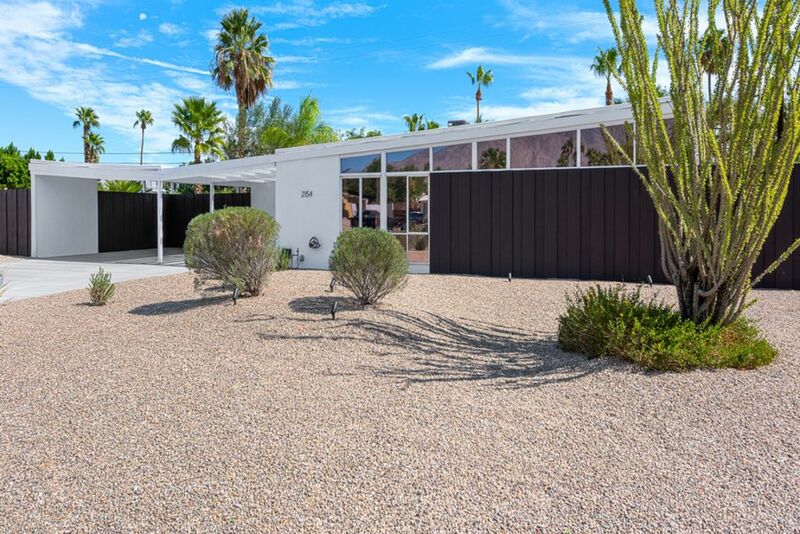 We hope you appreciate this unique mid-century modern Palm Springs neighborhood. Uptown Design & Restaurant District within 2 miles. Nice views of the San Jacinto mountains. Optional heating at an additional charge. Owners were great, the place was fantastic and well kept. Thank you! We LOVED our stay! Paul and Dean go out of their way to make sure everything is perfect. The outside pool area was amazing. The landscape was beautiful-filled with palm trees and twinkle lights. Loungers were comfortable and moveable, and the umbrellas were perfectly placed to provide shade when needed. The pool was our favorite part. We could not get out of it. The water was heated to 90 degrees, and one end of the pool was a lined with waterfalls that overflowed with hot water-amazing!! In the spring, the mornings and evening are cool; sitting poolside under blankets listening to the waterfalls was so peaceful. Our stay provided the perfect place to relax. A huge thanks to Paul and Dean. Great property. Close location to the main dining and shopping area of Palm Springs. The house is very clean and spacious and has everything you will need for a great vacation! The owners are easy to work with and available to answer any questions that aren’t addressed in the very comprehensive “guest manual” that is at the house. Beautiful backyard and pool. We had an amazing time exploring the area and it was so nice to come back to such a lovely property at the end of the day! Thanks, Courtney. Happy to be your home-away-from-home! The house is every bit as lovely as the pictures. You can tell that our hosts take this seriously...the kitchen was fully stocked...current audio technology...very clean...just the perfect home for our week in Palm Springs. Paul and Dean offered to let us stay a bit longer before check out to accommodate our late flight. They did the same on check in because of our early flight. I realize that that might not always be possible, but we really appreciated the gesture! We plan on returning! Thanks, Jan, for the kind words! My family has rented homes from Paul and Dean for years now. Their rentals continue to be impeccable. They are continually adding new elements to ensure the homes never grow tired looking from heavy usage. Their homes are beautiful, clean and have everything you need for a relaxing and memorable vacation. Once again their George house was the perfect setting for my family during our annual February trip to Palm Springs. You could not ask for more attentive and caring property owners. Awe, shucks, Sarah! Always good to see you and Betty. This house was new on inside and super clean. The owners were above average customer service for all details. Great house for dogs too. Lots of room outside. We will stay there again. Thanks, Gloria! We're happy to host you and the family anytime.